How much of your day is yours? Better question yet: How much of your day should be yours? Of course I am referring to your Business Day; Believe it or not, you only need to find a way to control two hours a day in order to become highly effective. The Business of Real Estate is the Business of Conversations – good agents talk for a living, and the levers that trigger those conversations are your customers. In order for you to derive the most out of your day you must have clarity of purpose for each day, for each week, for each month, and for your whole year. That Clarity is reinforced by the work you do on your projects, and on your own, every single morning, preferably before your phone starts ringing or your text message start piling up. You need a Solid hour to 90 minutes each morning to mold your day into shape; and you need 30 minutes at the end of each day to acknowledge all your commitments and craft them into a cohesive whole. Many agents over-rely on their capacity to remember and waste so many opportunities. 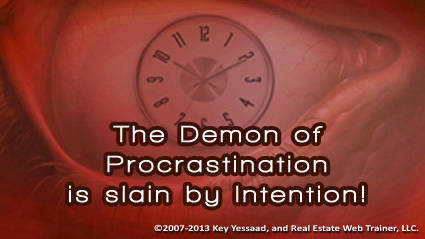 Try it, you will never have to suffer from the demon of procrastination!